Recently a local tea shop offered a matcha green tea tasting. Being a lover of all things tea, I attended and brought along hubby so we could experiment together. We learned that he is not a big fan of matcha, being a coffee aficionado. But I left with the inspiration to bake with the green tea powder. 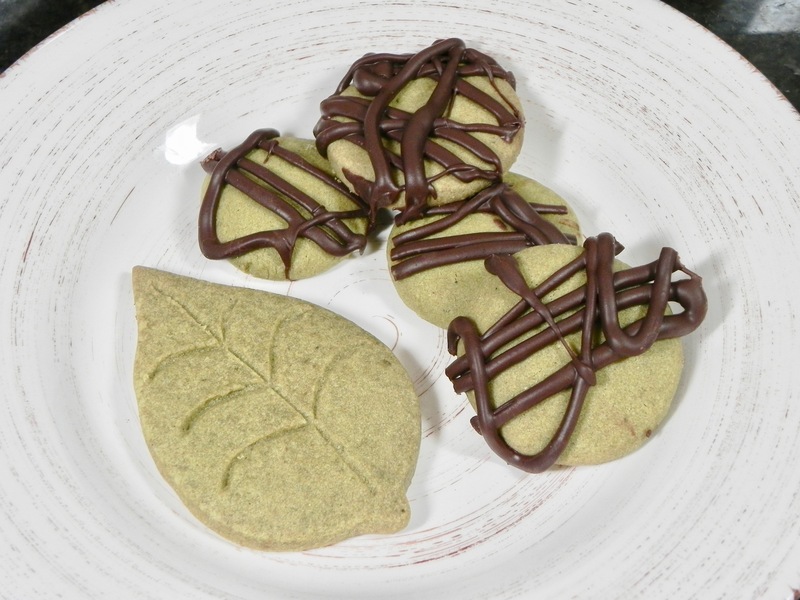 The challenge was to make it palatable for hubby, so I found a matcha cookie recipe and used a matcha / cocoa blend to appeal to his taste for chocolate. The result was a light, not too sweet cookie that we both enjoyed. To veganize the recipe I replaced the butter with vegan margarine. My high altitude adjustment was to introduce a little non-dairy milk to counteract the dryness. You may think that adding tea to a recipe would make the cookie gritty, but matcha is powdered, not ground. If you find that your matcha is a little chunky, then sift it before measuring out the amount. These cookies are an eye catching green, but I couldn’t resist getting artistic and drizzling them with chocolate. Sift flour, matcha, and salt into a bowl. In the bowl of a stand mixer, beat margarine and powdered sugar until fluffy. Add non-dairy milk and beat again. Add flour mixture to mixer bowl and mix slowly until dough just comes together. Form dough into a log that is 2” in diameter. Wrap dough log in parchment paper and place in freezer for 30 minutes or until dough has firmed to the touch. Preheat oven to 325F. Slice dough into 1/4” rounds and place on a parchment lined cookie sheet, 1” apart. Alternatively, take dough from freezer, pinch off round balls, place on cookie sheet, and flatten with the palm of your hand. Bake for 16 to 18 minutes (or until cookies are just starting to turn golden around the edges), turning pan halfway through baking time. Remove cookies immediately from cookie sheet and cool on a wire rack. Melt chocolate chips in a double boiler on the stove. Decorate cookies with melted chocolate. Store in an airtight container.